Background to the biscuit industry; Hygiene and safety aspects; Sheeting, gauging and cutting; Laminating; Rotary moulding; Extruding, wire cutting and depositing; Care, cleaning and maintenance. This stage in biscuit production is often a source of problems. The author identifies what these problems are at each stage, explains their causes and how they can be resolved. Duncan Manley is an internationally-renowned consultant to the biscuit and food industries, with over 40 years’ experience. 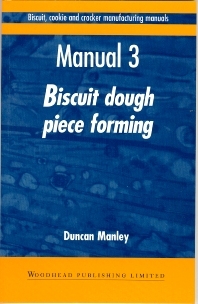 He is the author of the Biscuit, cookie and cracker manufacturing manuals and Biscuit, cracker and cookie recipes for the food industry, also published by Woodhead Publishing.